The only problem was I still did not manage to get a Bundt pan and had to make do a make shift Bundt pan and to refrain the kids from eating the cake batter. Roshan also had a marble fruit cake but trust me everyone was prepared to run a mile on seeing dry fruits and nuts. We had stuffed ourselves to the full with the fruit cake during Christmas. So I chose to keep it simple and opted to make a chocolate marble cake instead. This cake is very simple to make especially with the kids in tow and will make a perfect tea time treat. Preheat the oven to 180 Deg C. Grease a Bundt pan well and keep it ready. As I did not have a Bundt pan I took a normal pan and placed a muffin can into the middle. Make sure that you grease the inside of the pan and the outside of the muffin case. Sieve together flour, baking powder, baking soda and salt together. Beat butter and castor sugar till they are fluffly. Add the egg, milk, vanilla essence and beat well together. Add the flour mixture to this and beat till mixed properly. Divide the batter into 2 parts in the ratio of 3/4 and 1/4. To the 1/4 portion add cocoa powder and mix well. Add the vanilla mixture and cocoa mixture to the pan alternating it as shown in the picture. If any batter is left out place the vanilla mixture on top of the cocoa mixture and vice versa for the second layer. Using a sharp tipped knife make an incision into the batter and proceed to draw lines around the pan as shown in the picture. Doesn’t it look cute ? Just keep in mind not to over do it. Tap the tray on the counter to get rid of any air bubbles. Slip into the oven and bake for 35-40 min. Cool for 30 min in tray and then slice and serve with tea. This turned out to be a deliciously spongy, soft and moist cake. I would have gotten perfect slices had it not been for Arun, who due to his over enthusiasm pulled out the muffin case in the middle immediately after I took it out of the oven. So the cake broke unevenly in the pan itself. So when I inverted it after cooling it off, it came out unevenly. But still I guess only the taste, the experience and the time well spent only should matter in this case. I shall be updating this post with decent clicks when I make it again. It took me 50 min to bake the cake. I did not have castor sugar so powdered regular sugar in the mixie. If using salted butter omit the salt in the recipe. You can use any normal pan for baking the cake and not necessarily a Bundt pan. This is off to the Blog Hop Wednesdays and join me here to check out the other Blog Hoppers creations. 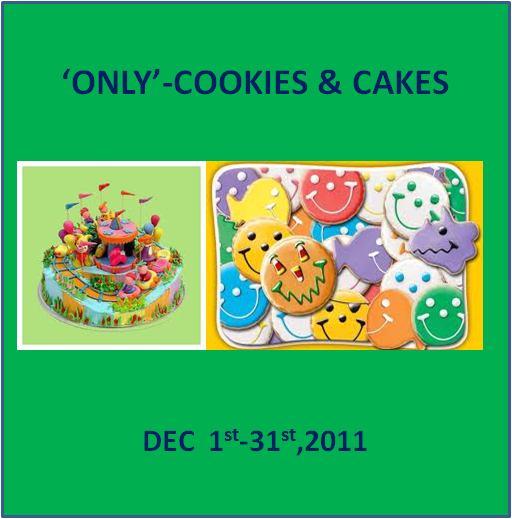 This is also off to my event Let’s Cook – Baked Goodies, Sangee’s Bake Fest and to Pari’s Only Cakes n Cookies. Looks so soft n delicious, lip smacking recipe!! Nice presentation and yummy recipe dear!!! wow luks so tempting…yummy cake…i m ur happy follower now….visit my space sometime ! Marble cake looks very soft and super delicious. Love the idea of using muffin pan. Lovely! I’m always impressed by the patterns of marble cake. Happy New Year, my friend! Kudos to you for going ahead and making this tasty cake without a bundt pan-in the end it is the taste that counts! The best thing about bundt cake recipes is that they are so tasty they need no icing. Your cake here does look deliciously moist and the flavor combo is hard to resist. I would love to have that plate of cake in front of me right now-yum! super mosit and delicious cake, well explained !! 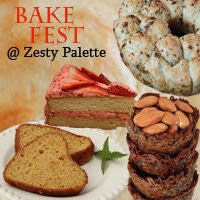 thanks for linking it to bake fest..
Looks yumm… even though its not perfect slices… Have been wanting to try marble cake guess this is the perfect recipe that i should start with. thanks for preparing the Marble cake and for all the mention in your blog…. i am a fan of your cooking. i usually follow your recipe to the T. But in this marble cake, you have written milk but it does not appear anywhere while preparing the cake. i blindly followed the directions and there the milk was sitting on the platform, laughing at me. the cake still came out ok but not great. @ Prerna: That was a terrible oversight from my part. I shall update the post. thank you for pointing out the oversight. shall be more careful in future. today i made the marble cake without forgetting the milk. came out superb. when it cooled down, i poured glaze over it, made by boiling half cup sugar, 4 tbsb butter, 2tbsp milk and 2 tbsb cocoa for just two mins. after removing from heat i added 2 tsp vanilla and immediately poured it over the cake. after some time, it solidifies and the cake looks smooth and shining. sadly, i couldnt click a pic. do try it.